10 A None No Power Seat 10 A is designated by Thomson Airways as an Extra Legroom seat with extra seat pitch. Thomson charges an additional fee to reserve this seat. 10 B None No Power Seat 10 B is designated by Thomson Airways as an Extra Legroom seat with extra seat pitch. Thomson charges an additional fee to reserve this seat. 10 C None No Power Seat 10 C is designated by Thomson Airways as an Extra Legroom seat with extra seat pitch. Thomson charges an additional fee to reserve this seat. 10 D None No Power Seat 10 D is designated by Thomson Airways as an Extra Legroom seat with extra seat pitch. Thomson charges an additional fee to reserve this seat. 10 E None No Power Seat 10 E is designated by Thomson Airways as an Extra Legroom seat with extra seat pitch. Thomson charges an additional fee to reserve this seat. 10 F None No Power Seat 10 F is designated by Thomson Airways as an Extra Legroom seat with extra seat pitch. Thomson charges an additional fee to reserve this seat. 11 A None No Power Seat 11 A is an Economy Class seat that may not recline. This seat is designated by Thomson Airways as an Extra Legroom seat with extra seat pitch. Thomson charges an additional fee to reserve this seat. 11 B None No Power Seat 11 B is an Economy Class seat that may not recline. This seat is designated by Thomson Airways as an Extra Legroom seat with extra seat pitch. Thomson charges an additional fee to reserve this seat. 11 C None No Power Seat 11 C is an Economy Class seat that may not recline. This seat is designated by Thomson Airways as an Extra Legroom seat with extra seat pitch. Thomson charges an additional fee to reserve this seat. 11 D None No Power Seat 11 D is an Economy Class seat that may not recline. This seat is designated by Thomson Airways as an Extra Legroom seat with extra seat pitch. Thomson charges an additional fee to reserve this seat. 11 E None No Power Seat 11 E is an Economy Class seat that may not recline. This seat is designated by Thomson Airways as an Extra Legroom seat with extra seat pitch. Thomson charges an additional fee to reserve this seat. 11 F None No Power Seat 11 F is an Economy Class seat that may not recline. This seat is designated by Thomson Airways as an Extra Legroom seat with extra seat pitch. Thomson charges an additional fee to reserve this seat. 12 D None No Power Seat 12 D is an Economy Class Exit Row seat that may have extra legroom. The tray table is located in the armrest, making the armrest immovable and slightly reducing seat width. 12 E None No Power Seat 12 E is an Economy Class Exit Row seat that may have extra legroom. The tray table is located in the armrest, making the armrest immovable and slightly reducing seat width. 13 A None No Power Seat 13 A is a standard Economy Class seat that may have extra legroom. The tray table is located in the armrest, making the armrest immovable and slightly reducing seat width. 13 B None No Power Seat 13 B is a standard Economy Class seat that may have extra legroom. The tray table is located in the armrest, making the armrest immovable and slightly reducing seat width. 13 C None No Power Seat 13 C is a standard Economy Class seat that may have extra legroom. The tray table is located in the armrest, making the armrest immovable and slightly reducing seat width. 13 F None No Power Seat 13 F is a standard Economy Class seat that may have extra legroom. The tray table is located in the armrest, making the armrest immovable and slightly reducing seat width. 16 F None No Power Seat 16 F is a standard Economy Class seat that is missing a window. 2 A None No Power Seat 2 A is an Economy Class Bulkhead seat. The proximity to the lavatory and galley may be bothersome. The tray table is located in the armrest, making the armrest immovable and slightly reducing seat width. 2 B None No Power Seat 2 B is an Economy Class Bulkhead seat. The proximity to the lavatory and galley may be bothersome. The tray table is located in the armrest, making the armrest immovable and slightly reducing seat width. 2 C None No Power Seat 2 C is an Economy Class Bulkhead seat. The proximity to the lavatory and galley may be bothersome. The tray table is located in the armrest, making the armrest immovable and slightly reducing seat width. 2 D None No Power Seat 2 D is an Economy Class Bulkhead seat. The proximity to the lavatory and galley may be bothersome. The tray table is located in the armrest, making the armrest immovable and slightly reducing seat width. 2 E None No Power Seat 2 E is an Economy Class Bulkhead seat. The proximity to the lavatory and galley may be bothersome. The tray table is located in the armrest, making the armrest immovable and slightly reducing seat width. 2 F None No Power Seat 2 F is an Economy Class Bulkhead seat. The proximity to the lavatory and galley may be bothersome. The tray table is located in the armrest, making the armrest immovable and slightly reducing seat width. 30 A None No Power Seat 30 A is an Economy Class seat that may have limited recline. The close proximity to the lavatory may be bothersome. 30 B None No Power Seat 30 B is an Economy Class seat that may have limited recline. The close proximity to the lavatory may be bothersome. 30 C None No Power Seat 30 C is an Economy Class seat that may have limited recline. The close proximity to the lavatory may be bothersome. 30 D None No Power Seat 30 D is an Economy Class seat. The close proximity to the lavatory may be bothersome. 31 D None No Power Seat 31 D is an Economy Class seat that may have limited recline. The close proximity to the lavatory may be bothersome. 31 E None No Power Seat 31 E is an Economy Class seat that may have limited recline. The close proximity to the lavatory may be bothersome. 31 F None No Power Seat 31 F is an Economy Class seat that may have limited recline. The close proximity to the lavatory may be bothersome. 32 A None No Power Seat 32 A is an Economy Class seat where the close proximity to the lavatory may be bothersome. The tray table is located in the armrest, making the armrest immovable and slightly reducing seat width. 32 B None No Power Seat 32 B is an Economy Class seat where the close proximity to the lavatory may be bothersome. The tray table is located in the armrest, making the armrest immovable and slightly reducing seat width. 32 C None No Power Seat 32 C is an Economy Class seat where the close proximity to the lavatory may be bothersome. The tray table is located in the armrest, making the armrest immovable and slightly reducing seat width. 32 D None No Power Seat 32 D is an Economy Class seat where the close proximity to the lavatory may be bothersome. The tray table is located in the armrest, making the armrest immovable and slightly reducing seat width. 32 E None No Power Seat 32 E is an Economy Class seat where the close proximity to the lavatory may be bothersome. The tray table is located in the armrest, making the armrest immovable and slightly reducing seat width. 32 F None No Power Seat 32 F is an Economy Class seat where the close proximity to the lavatory may be bothersome. The tray table is located in the armrest, making the armrest immovable and slightly reducing seat width. 41 A None No Power Seat 41 A is an Economy Class seat located in the last row of the plane that may have limited recline. 41 B None No Power Seat 41 B is an Economy Class seat located in the last row of the plane that may have limited recline. 41 C None No Power Seat 41 C is an Economy Class seat located in the last row of the plane that may have limited recline. 41 D None No Power Seat 41 D is an Economy Class seat located in the last row of the plane that may have limited recline. 41 E None No Power Seat 41 E is an Economy Class seat located in the last row of the plane that may have limited recline. 41 F None No Power Seat 41 F is an Economy Class seat located in the last row of the plane that may have limited recline. 9 A None No Power Seat 9 A is designated by Thomson Airways as an Extra Legroom seat with extra seat pitch. Thomson charges an additional fee to reserve this seat. 9 B None No Power Seat 9 B is designated by Thomson Airways as an Extra Legroom seat with extra seat pitch. Thomson charges an additional fee to reserve this seat. 9 C None No Power Seat 9 C is designated by Thomson Airways as an Extra Legroom seat with extra seat pitch. Thomson charges an additional fee to reserve this seat. 9 D None No Power Seat 9 D is designated by Thomson Airways as an Extra Legroom seat with extra seat pitch. Thomson charges an additional fee to reserve this seat. 9 E None No Power Seat 9 E is designated by Thomson Airways as an Extra Legroom seat with extra seat pitch. Thomson charges an additional fee to reserve this seat. 9 F None No Power Seat 9 F is designated by Thomson Airways as an Extra Legroom seat with extra seat pitch. Thomson charges an additional fee to reserve this seat. This Boeing 757-200 aircraft seats 233 passengers in a one-class configuration and is used on short to medium-haul routes. Yesterday 13/4/18 travelled from Majorca to Gatwick in seat 10A ( Premium) outbound was in 10F. I worked for BOAC and then British Airways for just short of 40 years. These 757's are getting old but the condition of both the outbound and inbound aircraft were superb and have obviously had recent refits. Well done TUI. The 757 is an excellent and safe aircraft with Rolls Royce RB211 engines. Seat padding on aircraft are no longer deep and voluptious - try them all and you will see.The leather on our seats both out and back was excellent. Legroom - paid an extra £35 was good ( about what economy used to be years ago). Crew were brilliant and hardworking - a credit to TUI. Really rubbish. Seat pitch was awful. Freezing cold and what padding there was, was worn out. Looking around other seats appeared to be worn out. Has a seat designer ever sat in their seat as the head rest was too far back and low. I am only 5 ft 8in but found the headrest was too low and angled backward too much. In order to get comfortable you need to slide your bottom away from the backrest than leads to backache. This is the last time I will fly Tui. Good seats to book. Slightly greater pitch than the normal cattle class. As usual on these flights, the cabin temperature is far lower than acceptable. No amount of moaning will change that, so take an extra layer of clothing. The plane was old and certainly showed it's age,there was no inflight entertainment on the 6 hour outgoing and return journey. The toilets were disgusting, smelt, floor covering loose. My advice is check what sort of plane you will get and I wonder if they use these old planes across the European countries they fly from. rubbish space cramped freezing and you could hear the hydraulics very loud and i hated it. liked 787 and 767 but 757 is a dump! very poor seating arrangement. be warned when you are average height the leg room is ridiculous.worst airline I have flown with. you definitely treated like cattle.The captain still wishes you a relaxed flight.Is it a joke? Extra space but the cold draught at foot level was uncomfortable. Had to place inflight brochure at bottom of door to assist in reducing the cold draught. Poor seat, during take off and landing covered by air conditioning fluid. The air hostess advised this is standard, So if you want to sit in the splash zone on this flight feel free. No window which made the journey home from holiday a little claustrophobic (4hrs). The rows are bizzarely staggered, 16C is not alongside 16D either. Good point is that we were the second row to be served food and drinks! The plane is very crammed for a six hour flight to cape verde. Plane is very tired and old. 32A is next to the emergency exit which has an additional box mounted on it, for the emergency slide, severly restricting the legroom available. I travelled from Glasgow to dalaman onboard this type. The seats were fine i kind of liked the leathery seats my only issue was that there wasn't any in-Flight entertainment. I was sat and literally did nothing for the 4 and half hour journey. Other than that, perfect! 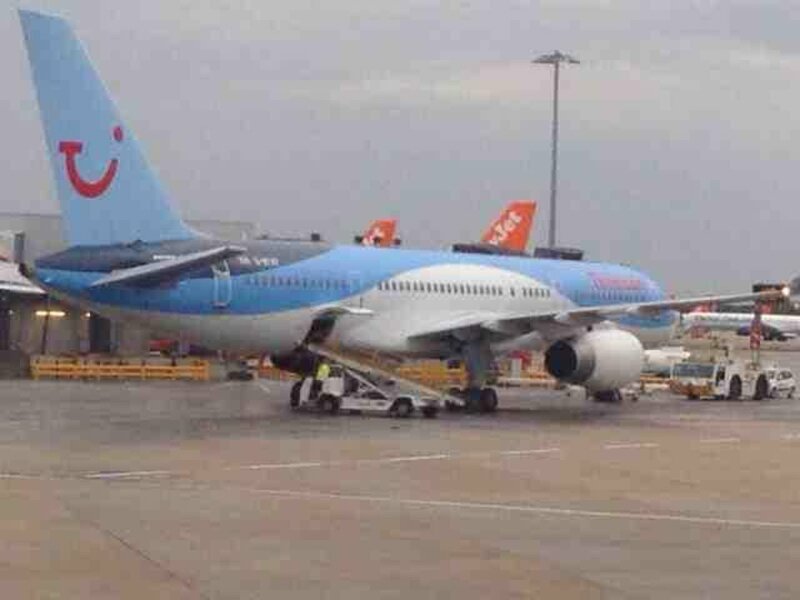 I've flown on several Thomson B757's in the previous years and they really are getting tired and old now. The blue 'leather' seats are very worn, marked and must have no padding anymore they are so uncomfortable. For this flight I traveled with my 2 year old daughter and wife, I've never seen an aircraft with such poorly provisioned toilets - one up front next to the galley behind a curtain and two towards the rear of the aircraft. Only one of these had a baby changing dropdown and on our 'holiday' charter flight there must have been 30 babies or toddlers including our own daughter. Service was slow, not particularly cheap but the staff were friendly despite this been the return leg. The sooner Thomson retire these old aircraft the better. We flew to Gran Canaria from Birmingham on this flight. I booked the rear row against the toilet so we could put the seat back but didnt realise until sat down that the recline was less than an inch. The seats were fairly cramped but better than Thomas Cook or Ryanair. The planes looked really old, no individual air vents and very old light and emergency switches. No entertainment and slow food delivery. The saving grace was the price, we paid £150 each return during Easter so little to complain about. I will fly with them again. Supposed to be window seat but is not! No ability to control airflow towards passengers--controlled centrally. The person I was travelling with had COPD and needed to be able to control the air..NOT GOOD! 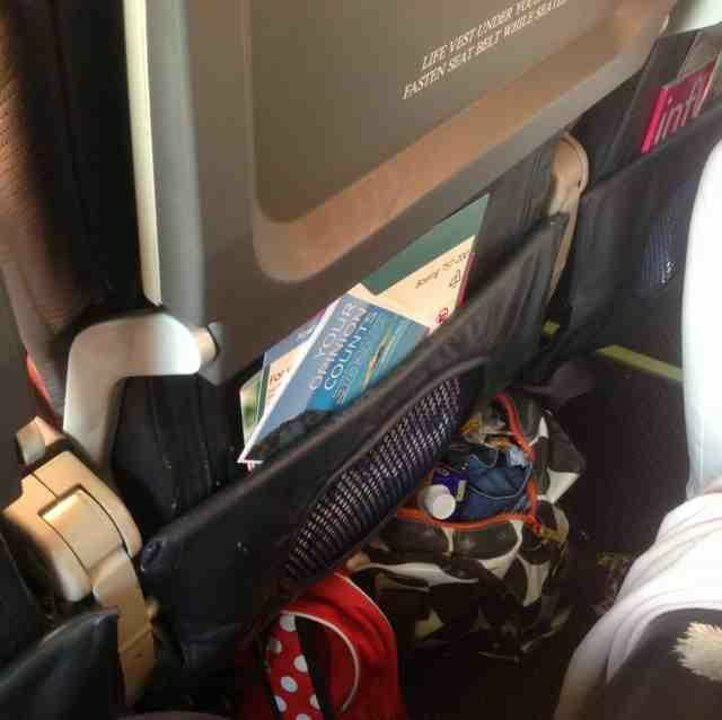 This was available on the return flight TOM 2403 Seat 19E but there was a broken table! I paid a supplement for extra legroom which was adequate but the aircraft are long overdue for replacement. The padding in my seat was non-existent and the seat belt was badly worn. If this had been a motor car undergoing an MOT, it would have failed. These seats are extremely cold during the flight as they are next to the door. They are often used as standing places for passengers who wish to stretch their legs during the flight. 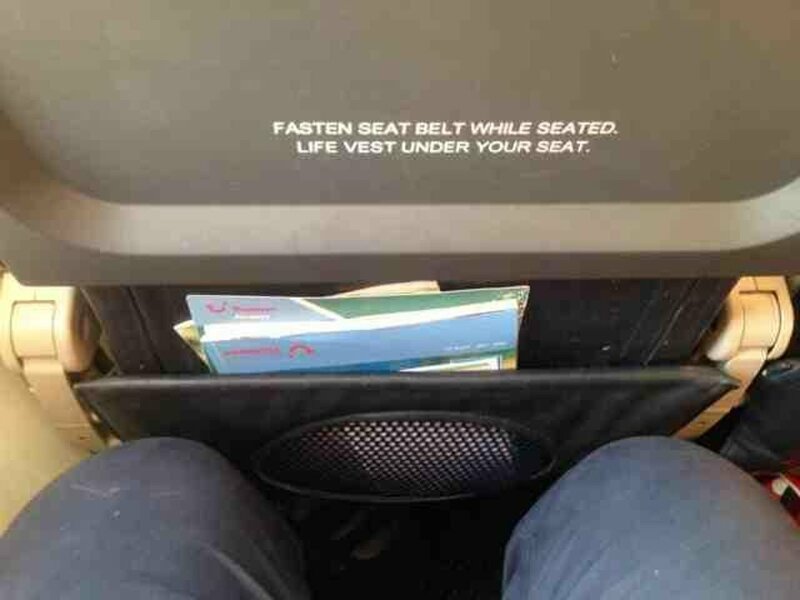 Typical Thomson Airways 757; outdated, old, and very little legroom. Thankfully it was only a 3 1/2 hour flight otherwise I would have really struggled as myself and my family were rather crammed in. 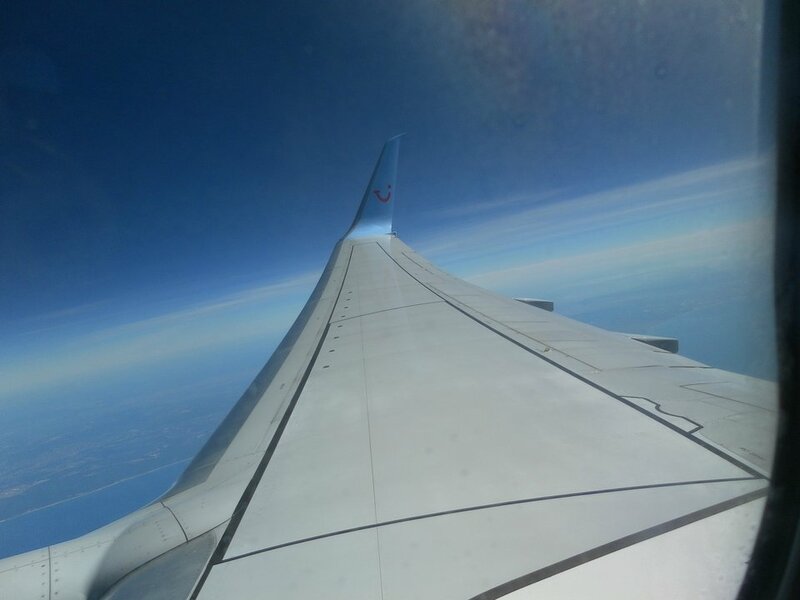 Suggest if at all possible using Thomas Cook aircraft over Thomson 757s any day of the week. Poor Service, Poor Plane, Flying Thomson? Never Again! Seat was as expected a little worn but not unappealing. The plane was great and was great for a charter flight/airline. 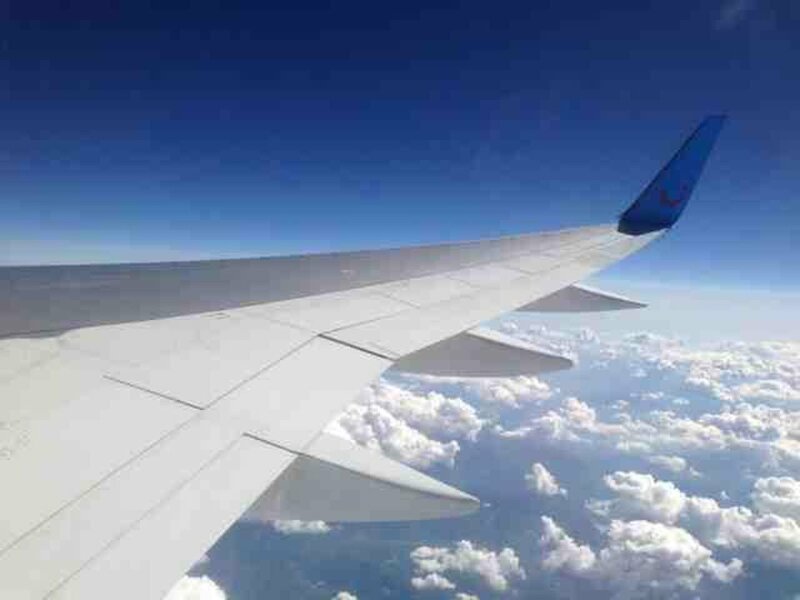 There were three of us, I sat at the window seat (F) on the Outbound trip and the aisle seat (D) on the Return. Overall the plane was as expected, a little worn and outdated but it was comfortable enough and did the job. Legroom is minimal so i would recommend you spend a little more for a seat with extra leg room if you are a person that needs it, I as a shorter person however was fine. Food and Drink a little overpriced but i'm sure that is no shock. Just be wary if on the aisle seat for the above lockers as one old ladies walking stick fell out and hit me on the head as one other woman tried to get a massive cabin suitcase it, also resulting in one of our bags being moved. Overall the plane is good and does the job fine. We have used these Thompson Airways 757-200ERS for some year. Seat comfort and room was fine for a holiday charter, the 757-200 is a good aircraft quiet and gives a smooth ride even when going over the Alps. Thompson Airways 757 fleet is approaching replacement at 15 years old in 2015 which almost half the age of the 737 aircraft used by one airline operating similar routes. Thompson now sell sandwiches rather than serve meals on these European flights. We found the sandwiches of excellent quality and fairly priced. These aircraft have very little leg room, I spent the whole flight with my legs jammed up against the seat in front. If you are tall it is worth paying more for extra leg room seats. Some of the 757's only have 2 toilets in the middle instead of 3 as shown on the plan. All food and drink has to be paid for, nothing is free. This is Charter at it's worst. I seat is like any other seat - tray in front normal legroom but this ,like many others in close proximity, experience the ungodly noise and vibrations come from engines, flaps etc. I would advise , if possible, to get another if planning to have a sleep and/or relax during your flight. These planes are old! There is no individual air vents, the seat material is old and worn, the seat pitch is very small if you are tall. Some aisle arm rests sag through years of trolly abuse. Avoid these planes! Thomson flies 1 versions of Boeing 757-200 (752).